I did an article on 9” plates in the June 1981 issue of the PUMP. This was before we started the color inserts. Looking back at that article it is hard to believe the plates that we didn’t know about just eight years ago. So it’s time to do an update. 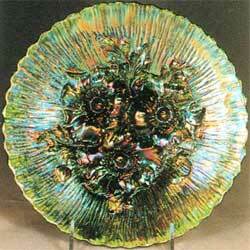 There are many plates that are much more rare than the ones shown here, but they could scarcely be more beautiful. I still have trouble getting a good picture of a pastel, so you will not see any in the color spread. It seems to create more interest when an attempt is made to rank items in the order of their rarity. 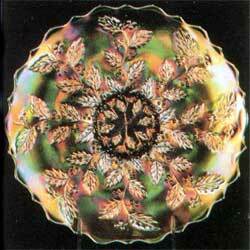 We’ll try to do so with these 9” plates. Please remember that “rarity” is difficult to define. It involves value, desirability and availability. I have tried to balance these factors in arriving at my listing of the top 25. 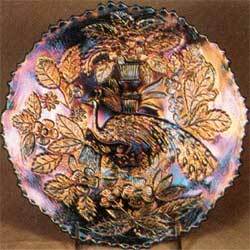 A plate can be the only known and still lack desirability and value to a collector. 1. Goddess of Harvest (Fenton)–Amethyst ($7,500) and Marigold ($6,000). Rumored for years, at least one in each color has now been confirmed. The amethyst one sold privately in 1987. 2. Poppy Show (Northwood in all probability, but never confirmed.) Aqua Opal (some think more blue opal than aqua opal) ($6,000). Only two or three of these are known. Also very rare in green, ice green, and ice blue. 3. Orange Tree (Fenton)–Aqua Opal $4,000). Only two are known. 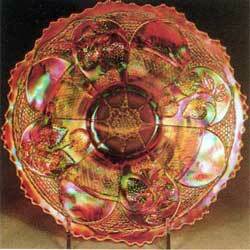 Also one very rare Peach Opal plate is known. 4. Peter Rabbit (Fenton)–Green ($3,000), Blue ($2,500), and Marigold $1,800). Very few in each color are known. 5. Good Luck (Northwood)–Ice Green ($2,500), Ice Blue ($2,250). Only one or two confirmed in each color. 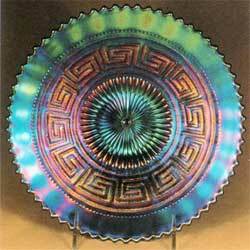 Like the pastel bowls in this pattern they have nearly all turned up in Australia. 6. Leaf Chain (Fenton)–Aqua Opal $2,500). 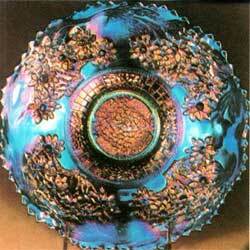 Two plates and one bowl known in this color. 7. Rose Show (Probably Northwood–never confirmed.) Iridized Custard $21,500), Lime Green Opal ($2,250), and Green (!,800). Also rare and desirable in Ice Green, Vaseline, and Ice Blue. 8. Absentee Dragon (Fenton)–Marigold $2,250). Two are known. 9. Hearts and Flowers (Northwood)–Ice Blue $2,000), Green ($1,600), and Ice Green ($1,500). 10. Holly (Fenton)–Aqua Opal $2,000), Celeste Blue ($1,800), and Red ($1,750). 11. Grape and Cable (Northwood)–Ice Blue $1,750) and Teal ($1,350). 12. Cobblestone (Imperial)–Purple $1,750). Only the one plate is known. A hard one to rank. It sold privately for $2,800 in 1987. It is not the greatest of patterns and I have trouble pricing it at that figure. 13. Greek Key (Northwood)–Blue $1,800). 14. Thistle (Fenton)–Green $1,800), Amethyst $1,600). 15. Three Fruits (Northwood)–Aqua Opal ($1,400), Ice Blue ($1,400). 16. Peacock on the Fence (Northwood)–Ice Blue ($2,000), Green ($1,200), decorated white plate $1,000). 17. Embroidered Mums (Northwood)–Ice Green $1,250), Ice Blue ($1,250), and White ($750). 18. Persian Medallion (Fenton)–Green $1,000), White ($9 00). One Green and two or three White are known. 19. Dragon and Lotus (Fenton)–Blue ($950), Marigold $750). 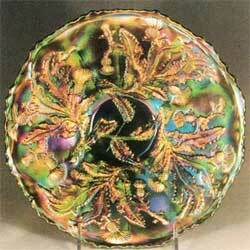 Two rare spatula footed plates are known in Peach Opal. 20. Nippon (Northwood)–White ($800). Only a couple are confirmed. 21. Coral (Fenton)–Marigold ($950). Bowls come in Marigold and Green, but plates were apparently not made in Green. 22. Concord (Fenton)–Green, $1,000), Amethyst ($800), and Marigold ($750). 23. 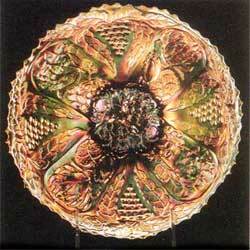 Autumn Acorn (Fenton)–Amethyst ($1,000), Green ($950). 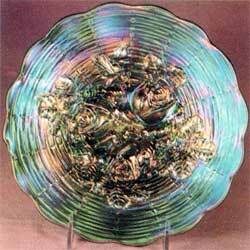 A common bowl, but Very rare in a plate. 24. Lotus and Grape (Fenton)–Green ($1,000), Blue ($850), Amethyst ($850), Marigold ($800). 25. 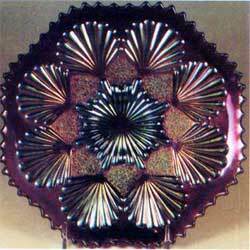 Shell and Sand (Imperial)–Purple ($800). Not generally appreciated, but a tough one to find. Just a final comment or two. 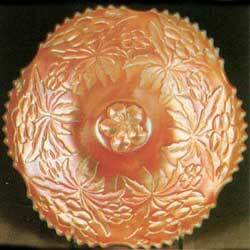 There are some 9” plates which I have eliminated that are very rare, but they turn up slightly at the outer edge. Because of this they are a bit “iffy” to be classified as true plates. In this category is the Fenton Plaid and the Millersburg Rosalind and Seaweed. There is also a very rare Roses and Greek Key plate that I have not ranked as it is really square instead of the usual 9” round shape. 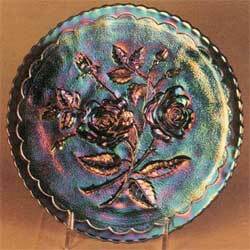 Neither have I included the 9” advertising plates such as Spectors, Old Rose Distilling, or the very rare Cooleemee. You will think of others, I am sure, that were overlooked and should have been mentioned.